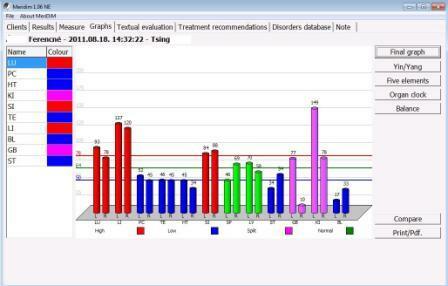 Evaluation are complex through well designed and visually very attractive charts. 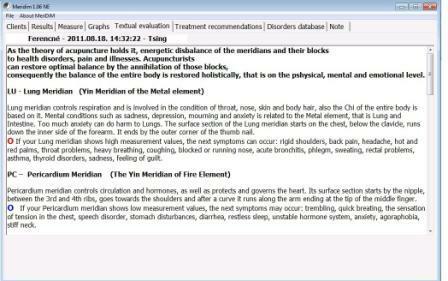 Several considerations are taken into account, and the result is a detailed map indicating the energy levels of the meridians (with reference to Yin, Yang, Five Elements, Intestinal Clock, Stability).In addition a full textual evaluation is gained of the state of the 12 main meridians. Diagrams indicate the 24 measurement types. The colours of the diagrams are changing according to the measured data. Colour changes indicate alterations from the average levels and also differences of the data measured of the left and right sides. The measurement results of the 24 meridians are shown as column diagrams. 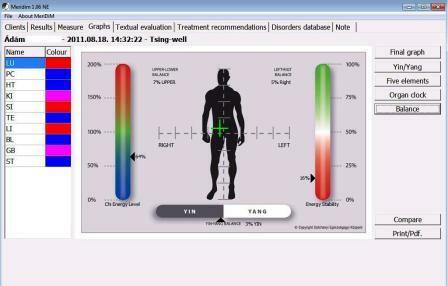 Its colours represent differerent measurement levels: green is for normal functioning; red indicates hyperfunction (too high levels), while blue represent hypofunction (too low levels), and pink stands for imbalance of a certain lateral meridian pair. The Yin/Yang chart deals with Yin and Yang meridians separately evaluating their average levels and the deviations from the average: that is Yin/Yang balance. It is possible to compare any two measurement values of a patient, e.g. as a follow up after treatment, but any other diagnostic measurements can be compared. 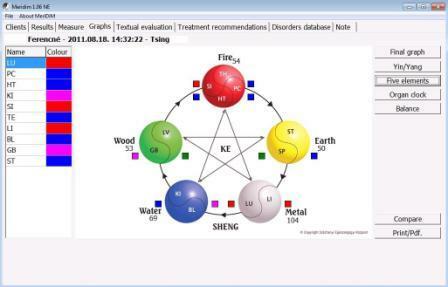 The measured values are shown in relation with the Five Elements– Five Movements theory of TCM. The graph indicates the relations of the Five elements while showing the measurement results. It shows the measurement results according to the Organ Clock theory: the hour by hour energy levels of the 12 main meridians. 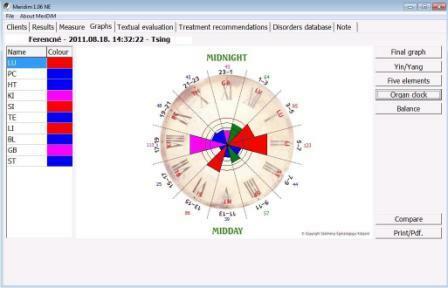 It shows personal and actual phase of Chi energies, Chi stability and imbalances of Yin/Yang laterally measured in comparison with proper male-female values. It makes it easier for both client and therapist to understand and follow treatment phases. The texts – just as the graphs and charts – can be printed and handed out if required by the patient.